Robert Blair was an 18th century Scottish poet and man of the cloth who followed his father, one of the King’s chaplains, into the ministry. He only published three poems in his relatively short life time but one of these brought him a great deal of fame. 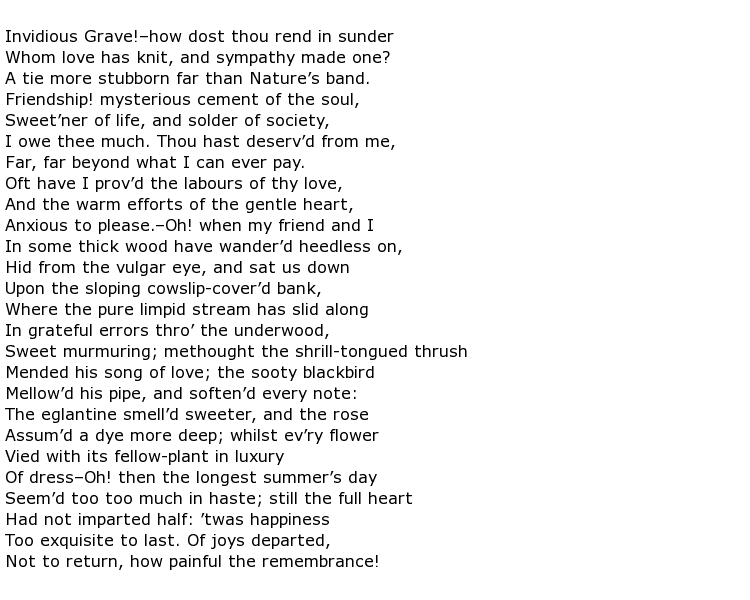 It is a long piece of blank verse, numbering some 767 lines, called The Grave. Later editions of this poem were illustrated by the artist William Blake who furnished a number of typically disturbing images to go with Blair’s words of great foreboding. He was born on the 17th April 1699 in Edinburgh into very comfortable circumstances. He was the eldest son of the Reverend Robert Blair, a minister who had been honoured with the title of King’s Chaplain. It seemed inevitable that Robert would follow his father into this profession and he eventually did so. He was well educated, studying firstly at the University of Edinburgh and then at an unrecorded educational establishment in the Netherlands. It is believed that Blair wrote a great deal of his poetry while still a student. In 1731 he was appointed to the “living of Athelstaneford”, a small town close to Edinburgh in the county of East Lothian. He took a wife seven years later and Isabella gave him six children. Having come from a relatively wealthy background Blair was able to indulge himself for the rest of his life, following one of his passions which was garden cultivation. His main interest though was writing poetry and studying the work of previous English poets. Perhaps he devoted so much time to his most well-known piece, The Grave, that there was little left over for the production of more published work. In fact he only published two more poems; one was a translation into English of a work by an unknown poet and the other was in commemoration of his father in law, the famous Professor William Law. The Grave was written in 1743 which, incidentally, was only three years before his own death. Maybe he had a premonition of his early demise, the subject, not surprisingly, being that of death and graveyards. It has religious undertones which, in a country such as Scotland, was bound to attract the attention of many people. Blair himself said though that the bulk of this piece was written before he became a minister. It was an inspiring piece and it spawned many imitators who became members of the so-called “graveyard school” of poetry. Some years later William Blake illustrated the poem with at least forty disturbing drawings such as The Skeleton Reanimated. This edition of the work did not see publication until 1808, sixty two years after the poet’s death. The Grave was reprinted many times, the latest version being published in Los Angeles in 1973. Robert Blair died on the 4th February 1746 at the young age of only 46.